Contemporary lady's ring in solid sterling silver and genuine copper-infused matrix turquoise. Fine craftsmanship. Trendy but with a touch of Southwest flair that is always exciting! Centerpiece meaures about 3/4" wide x 1" long (see ruler image). Note: Due to the nature of turquoise, variations in colors/shades/matrix and imperfections are normal. Our turquoise has been stabilized, treated, and color-enhanced for beauty and durability. Satisfaction always guaranteed. 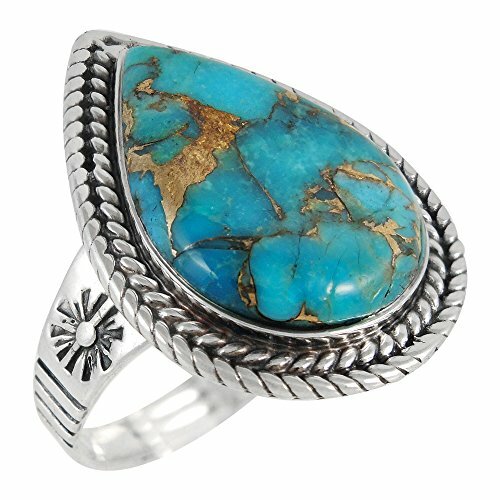 Genuine Turquoise (natural turquoise that has been treated & color-enhanced). Color/shades/matrix will vary.